Classic Design, the Burlington Edwardian Single Round Light is part of the elegant "Burlington" range. An amazing new range with its heart and soul firmly rooted in a bygone era. Outstanding traditional design using the latest modern methods and technologies. This Product will bring a touch of elegance to all Bathrooms. Can be installed anywhere within bathroom zones 2 & 3. Hi, yes the shade is made from glass. Thanks. Q. Is this product suitable to have close to a shower? 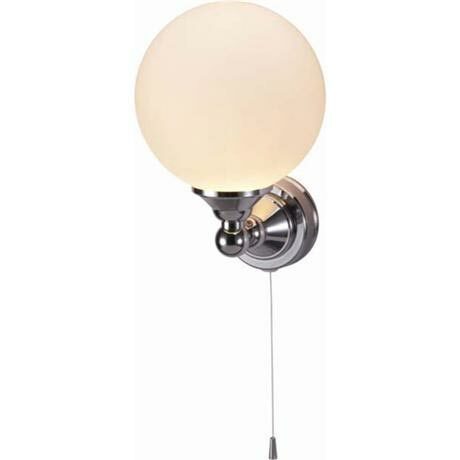 Hi Sofia, Burlington lamps are designed to be used in zone 2 or outside. If you are unsure of the bathroom zones, take a look at one of our 'forum lights' on our site, they all show a handy image detailing the different zones. I hope this helps, please let em know if you have any further questions.